The exterior of my home and camper needs some help. I started looking for the Best Power Washers for Home Use that would not break the bank and get the job done. Power options are available, Electric or Gas are the two that most people look at. 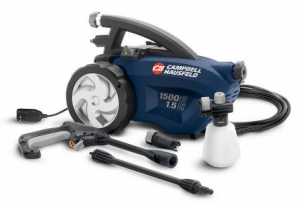 I choose to look at the 1500-1600 pounds per square inch Electric Power Washers, as I do not need to work outside my home and will be close to a power supply most of the time. 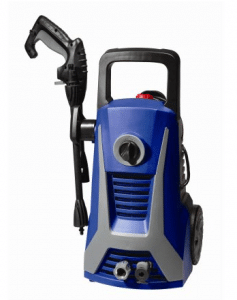 I will be using this Power Washer for small home use, siding, decks, shed and small other projects. This will not be for commercial or big projects. Lets look at some of the options that are available for this type and see what advantages each will bring. You will get a small compact Pressure Washer that will be easy to store when not in use. All of the accessories will store on the unit itself, so you will not have to look for attachments when starting a project. No tools are required for assembly. Just simply snap together the parts and you are ready to use. All tools and accessories have a storage place on the body of the washer. Has easy connect joints to make changing accessories easy and they are designed to prevent any leaks. You can operate the off on switch with your foot, as it is a big button on the top of the machine. Comes with two separate nozzles, variable spray and soap. No need to have several spray nozzles as this one is adjustable from a fine spray to a jet spray. Options are a brush, right angle nozzle and turbo nozzle. The turbo nozzle will spin the spray for the hard to clean areas, can cut cleaning time in half. Karcher pressure washers accessories will not fit this Pressure Washer. Can be used with a generator with 2700 watts output or greater if you cannot reach a power source with the 35 foot cord. 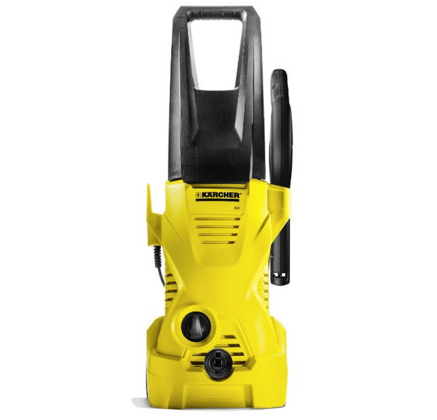 Do not use extension cords with this power washer. With the 20 foot pressure hose and 35 foot power cord, you can get pretty far from the power source. Watch this video to learn how to assemble out of the box. After some minor assembly your product will be ready for use. This unit is easy to use as the adjustable nozzle will let you go from a small stream to a wider spread. The only time you have to change nozzles is when you want to spray detergents from the attached tank. When you do release the trigger the motor will stop to release all water pressure. It has a carry handle and wheels for portability. The handle does not extend, some customers complained that it was too low to drag the unit around, much easier to pick up and carry. With a 19 foot hose and 35 foot power cord with a GFCI plug you can go 54 feet from you electric connection. The GFCI plug is hard to plug into a outlet that has a cover. Assembly will be to snap the wheels on, lock the handle in place, install the quick connectors for water supply and outlet hose. Insert each hose. Insert the spray wand of your choice, either the rotary spray wand or the variable power spray wand. Turning the end of the variable spray wand will adjust the pressure that comes out of the nozzle. Detergents can only be siphoned from an external container, as there is no internal soap container. You can purchase a soup dispenser wand for this unit. 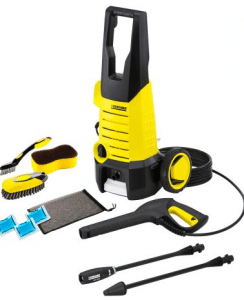 Most of the Karcher accessories are available for this unit. This will give you a great deal of options for your cleaning needs. As the others the 20 foot hose and 35 foot power cord will give you about 55 feet of distance between the power outlet and the work area. Make sure that the water is on when the pressure washer is turned on, running the motor dry will shorten its life. Some customers had trouble with the spray hose, make sure that when it is stored it is not kinked as this will shorten the life of the hose. Do not use the 5/8 inch diameter feed hose as this will lower the pressure and some stated that the washer would not work with this size of hose, use a 1/2 inch hose. Make sure when you are storing your Electric Pressure Washer that you have drained all of the water and soap out of the pump and hoses. Winter weather is the biggest killer of the smaller machines if any water is present inside. When looking for the Best Power Washers for Home Use, any of these three will work for lightweight cleaning. I would not recommend any of these for commercial or big homes with a lot of external cleaning. If you are careful you can even wash your car without taking the paint off. I do like the two that have the detergent dispenser attached, but I am going to go with the Karcher for the ability to have more accessories in the future. Look for a review of this item when I get it. I hope that you have found this article informative, if you have any questions or comments use the form below, I will get back to you quickly. Hi John. I’m glad I came across your post here. My dad is a professional house painter and does pressure washing as well. I’ve always asked him for help if I needed it, but you never know if he will be available. If I decide I need a pressure washer, I will come back and reference your site. I really liked how you broke everything down about each one you reviewed. Thank you so much! Although these Electric power washers are good around the house, using one for too big of a job will just wear it out quickly. I just recently find your website , and I really like it. You’ve chosen a very good niche, and it’s obvious that you really want to help people. Pressure washers can be really useful at home. I have one, and it’s amazing! I often wash my car and bike with it. It even can be useful indoors. I clean my shower cubicle with it. Definitely recommend for everyone. Using indoors takes a little more patients. You would not want to use a gas powered Pressure washer in the house. These make a great way to clean the hard to clean areas of your outdoor space. Thanks for stopping and looking. I will post more on pressure washing as I use mine. It cleans up decks and patios with little or not extra work other than holding the wand.